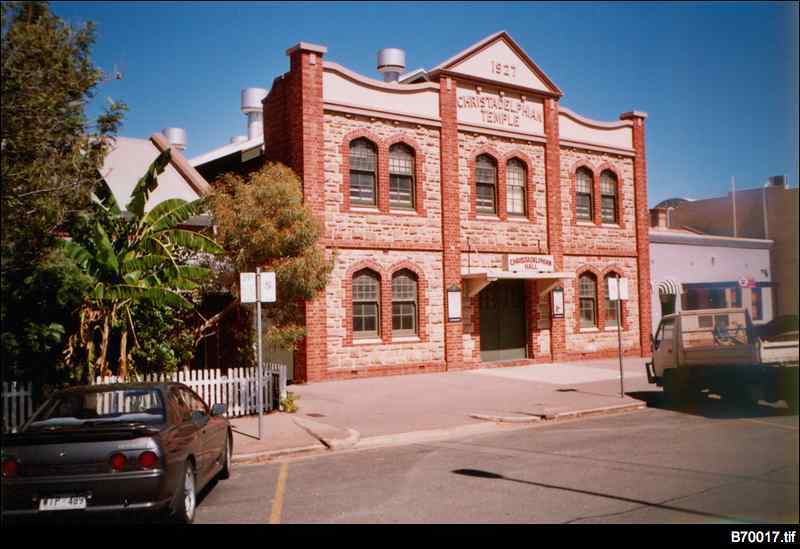 Adherants to the Christadelphian faith first began meeting in South Australia at Goolwa, south of Adelaide, in 1880. The movement was founded by an Englishman, Dr John Thomas, who on travelling to America in 1832 was influenced by the work of Alexander Campbell, founder of the Churches of Christ. However, the two men parted over doctrinal differences in 1837. Thomas' followers were originally called 'Thomasites'. During the American Civil War the group took a stance as conscientious objectors. It was at this time that they first became known as Christadelphians - 'Christ's brothers and sisters'. After Thomas' death in 1871, the Scotsman Robert Roberts became leader of the church. Roberts wrote many books and visited Australia twice in the 1890s. In 1908 the Adelaide ecclesia took over the former St Andrew's Presbyterian church in Wakefield Street, 'Willard Hall'. In 1927 the current building was built in Halifax Street.